The Bali Safari and Marine Park is a great place to visit on your next stay in Bali as it as one of Bali’s largest and most visited animal theme parks. The best way to enjoy the park is by taking one of their safari tours where you will see over 60 species of animals including the komodo dragon, orangutan, rhino, zebra, elephant and so much more! 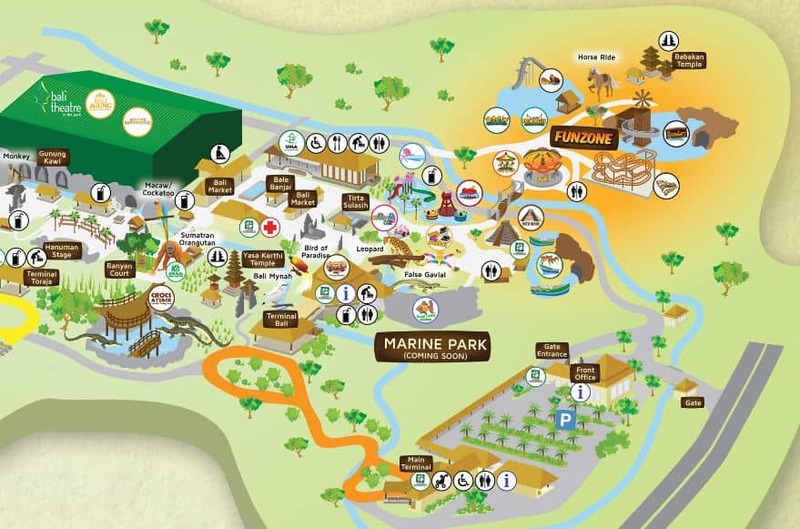 The Bali Safari and Marine Park has a strong focus on conservation, so you will also get to see a number of rare and endangered species here. 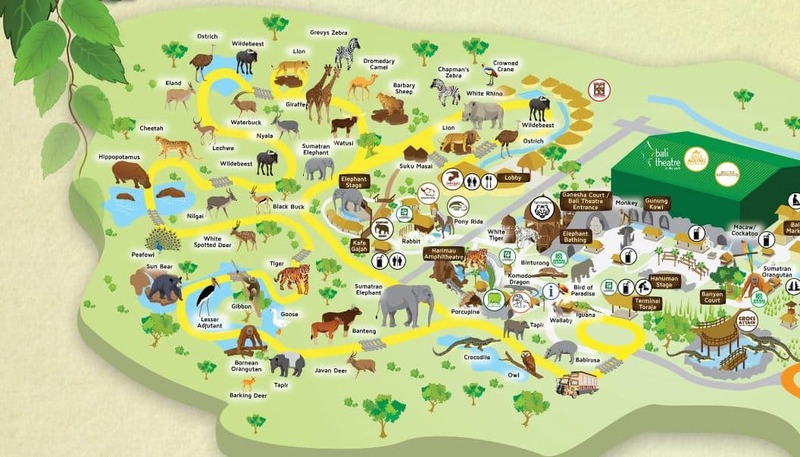 The park is set out in a natural landscape to give the animals a feeling of being out in the wild. Visitors can take one of the safari buses where you will be taken on a tour of the park where you can learn more about the animals that live here. Head through exhibits focusing on animals from Indonesia, India and Africa in your air conditioned tram and take some pictures of animals up close. The park also has a Waterzone and Fun Park where kids can come and play after a long day in the sun. There are pools for kids and adults as well as water slides for all ages. You will find a cafe here as well as showers and toilets for your convenience. The park now also offers a night safari where you can walk around the park or take a journey through the African savannah and then watch a traditional Balinese fire dance and puppet show. Dinner is also available at the onsite restaurant, so come along after dark for a unique experience! 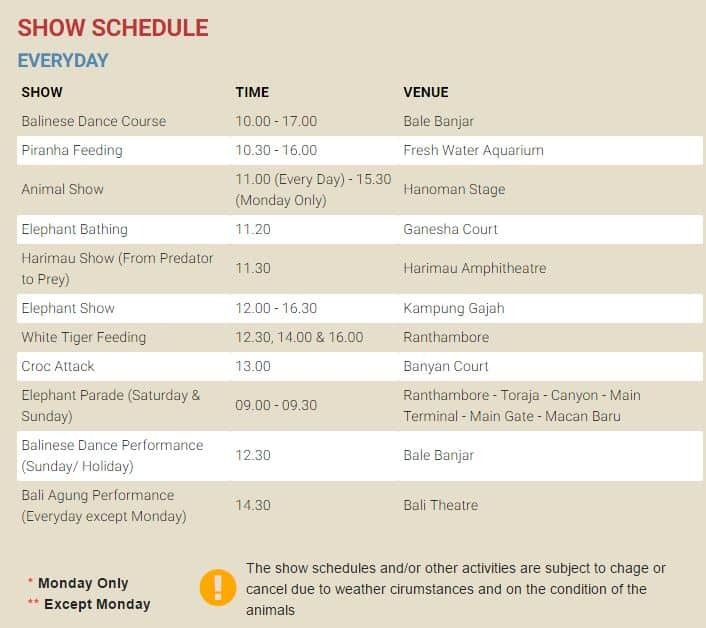 The Bali Agung show is also a feature of the park which brings together talented dancers, colourful costumes, puppets and animals for an amazing show. The theatre sits in the lush tropical jungle in the heart of the Bali Safari and Marine Park, so you can catch a show after a day at the park. 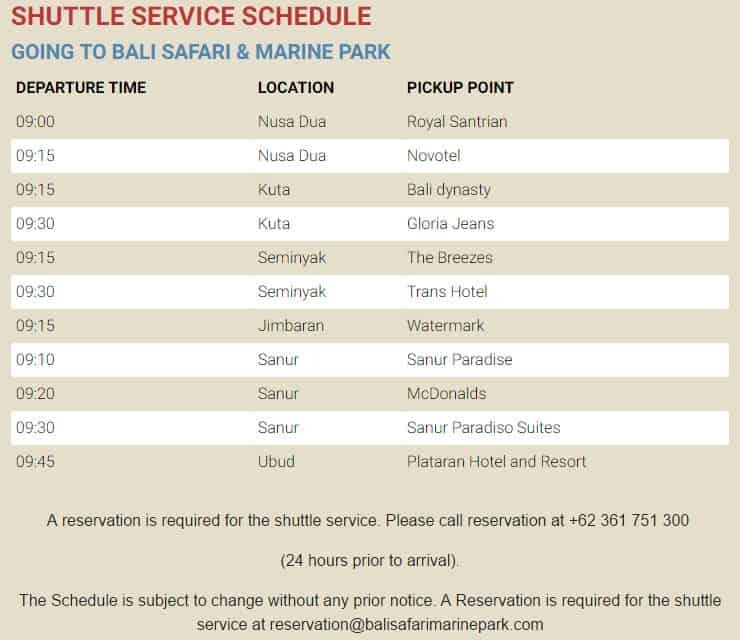 A shuttle bus is available to take visitors to and from the park, simply make a reservation 24 hours in advance by emailing reservation@balisafarimarinepark.com.